AWD is proud to back their work with a warranty that no other window retailer in the area can offer. When you purchase windows, doors or other fine home products from AWD, we stand by the installation for as long as you own your home. 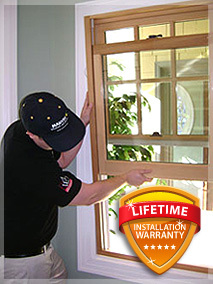 Our professional, in-house installers are licensed, insured, and thoroughly trained in the latest techniques to ensure windows and doors open, close and function properly for a lifetime. They’re so fussy, they’ll even vacuum when the installation is complete.